Today’s main news: SoFi seeks to poach Twitter COO for CEO slot. Zopa increases investor interest rates. SoftBank considers IPO in London. TransferWise launches borderless bank account. Spotcap partners with BAWAG Group for same-day financing. Today’s main analysis: Super high-interest loans in California have boomed. Today’s thought-provoking articles: How online branding can help businesses get a loan. Today’s banks need millennial banking tech framework. Millennials take micro loans for travel. Bank of America’s digital investments are paying off. Goldman Sachs posted first quarterly loss in 6 years. Zelle’s anti-fraud efforts trip up users. Loanable disrupts student loan industry with family loans. SoFi Parent Loan vs. PLUS Loan. Tax preparation firms offer 0% interest loans. Senate introduces Small Business Credit Availability Act. New York changes authority for online lending. Zopa increases investor interest rates. SoftBank looks at London IPO. Contego to verify open banking transactions. Envestnet/Yodlee unveils API for PSD2 compliance. LendInvest invests in first phase of development. China shakes up P2P lending. Springhouse receives vendor ranking from Morningstar. Banks need millennial banking tech framework. Spotcap partners with bank for same-day financing. AlfaToken ICO makes smart contracts more accessible. Big things coming to finance this year. More millennials borrow to travel. OJK to issue crowdfunding regulation. Axiata invested $200M in digital ventures, including lending. Sberbank plans crowdinvesting platform for small firms. Anthony Noto, a top Twitter Inc. executive, is in discussions to become the next chief executive of Social Finance Inc., according to people familiar with the matter, as the online lender grapples with accusations of improper workplace culture. The San Francisco-based company has offered the job to Mr. Noto, currently Twitter’s operations chief and before that a top Silicon Valley banker atGoldman Sachs Group Inc.,people familiar with the matter said. Mr. Noto is likely to make a decision in the coming days, the people said. He may turn down the offer, as terms haven’t yet been completed, or Twitter might lobby hard to keep him, especially with CEO Jack Dorsey splitting his time between the social-media service and Square. An increasing number of the largest online lenders, such as Kabbage (a ValuePenguin affiliate) and Funding Circle (also a ValuePenguin affiliate), are relying on online data in addition to traditional data points to gain a fuller picture of a business’s health. Kabbage, which recently received $200 million in funding from Credit Suisse, uses a fully automated underwriting process (involving no humans) to approve applicants and requires business owners to link online accounts, which run the gamut from bank accounts to vendor accounts, to complete an application. Even traditional lenders are getting in on this trend. JPMorgan Chase (a ValuePenguin affiliate), which recently renewed its partnership with online lender OnDeck (also a ValuePenguin affiliate), the largest online lender to small businesses, uses the latter’s underwriting technology, which considers online data points, to help it offer online business loans. Affordability test: This imposes two burdens on payday lenders. First, conducting an affordability analysis would increase the cost of underwriting a loan. Second, people generally turn to payday lenders when they are broke. Limit on the number of times a checking account can be debited. This rule limits the lender to two unsuccessful debit attempts. Afterwards, the lender can only attempt to debit the account if it receives authorization from the borrower. Risks are high: The people using payday loans are very high risk borrowers. Price competition is absent: For a payday loan, people value speed and access. Good behavior does not get rewarded: Payday lenders generally do not report to credit bureaus. The Consumer Financial Protection Bureau on Thursday dropped a lawsuit against four payday lenders. Since 2012, two of the firms — Golden Valley and Silver Cloud Financial — offered online loans between $300 and $1,200 with interest rates of up to 950%. The other two firms — Mountain Summit Financial and Majestic Lake Financial — also offered similar terms on loans, according to the bureau. BofA added about 2 million users to its digital channels, predominantly to mobile. 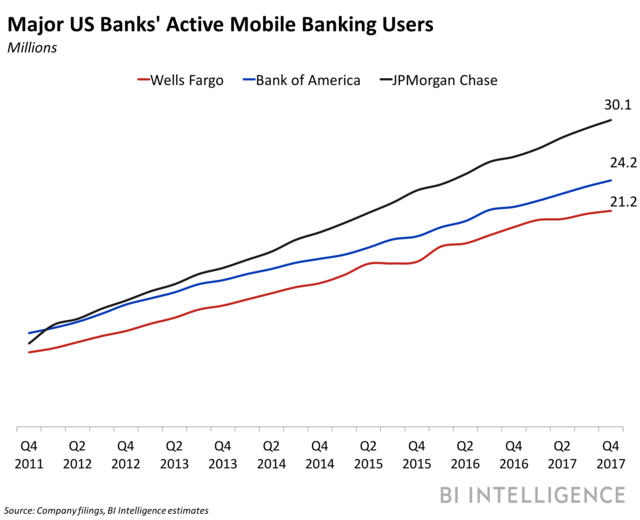 The bank’s active digital users jumped from 32.9 million to 34.9 million annually, an increase largely driven by mobile banking users, which increased by 2.6 million users year-over-year (YoY). Engagement is rising too. Mobile channel usage rose 34% YoY to reach 1.3 billion interactions in the quarter. BofA consistently updated its digital and mobile offerings throughout 2017, adding contactless ATM functionality, for example, and integrating tools like the popular peer-to-peer (P2P) offering Zelle. These innovations have likely contributed to rising interactions. Goldman Sachs posted its first quarterly loss in 6 years as its trading revenue was impacted by losses in commodities trading. GS, continuing on its strategic objective to generate $13 Bn in loans in 3 years, also announced that Marcus is now offering home improvement loans. These loans would range from $3,500 to $40,000, carry terms of 3 to 6 years, no origination fees, and 5 day turnaround. GS will be entering a market dominated by GreenSky, a marketplace lender that enjoys a funding advantage from its model of distributing loans to credit unions and participating banks. (PeerIQ provided a ‘tear down’ summary of the GS lending ambitions in aprior newsletter). Morgan Stanley’s earnings were boosted by record wealth management fees generated. American Express’ earnings were weighed down by a $2.6 Bn tax charge. Amex increased its loan loss provisions to $833 Mn and net charge-offs were 10 bps higher at 2.1%. Citigroup beat earnings estimates, even though it took a $22 Bn loss related to tax law changes, but emphasized the potential gains from the drop in tax rates to 24%. The person-to-person payments service Zelle differentiates itself from rivals by promising users that transactions sent over its network will clear in near-real time. Yet in recent months, the service has faced a number of complaints from consumers who say they are having problems sending or receiving money or setting up accounts in the first place. Zelle has acknowledged the problems, but says the occasional delay is the price some users will have to pay as the big banks’ rival to PayPal and Venmo aims to create one of the industry’s strictest fraud-prevention programs. One of the biggest (and most unique) new companies working in the online lending space is Loanable – a platform that brings together crowdfunding and peer-to-peer lending, but with a twist. According to Bernard Worth, who created Loanable along with co-founder Justin Straight, there is a whopping $1.3 trillion in American student loan debt. This system, which just launched in October of this year, is designed specifically for loans from friends and families. Loanable is an innovative way to get a low-interest loan from multiple friends and family members, without of lot of the awkwardness and tension that’s typically involved with borrowing from people you know. “The introduction of the Heller-Manchin Small Business Credit Availability Act is welcome news for America’s small and mid-sized businesses. The legislation recognizes that business development companies (BDCs) have become an important source of capital for Main Street businesses and modernizes the way BDCs are regulated. If passed, this bill could quickly result in billions of dollars of credit availability for companies often overlooked by traditional lenders,” said Joe Glatt, co-founding member of CSBG. Learn more about the Small Business Credit Availability Act (H.R. 3868) here. There is legislation moving through the state of New York that shifts some responsibility regarding online lending to the New York Department of Financial Services (NYDFS). NYDFS does not necessarily have a reputation for being Fintech nor innovation friendly. Read the New York Senate Act here. Zopa, one of the largest peer to peer lenders in the UK, has announced an increase in interest rates paid to investors. Zopa currently offers two diversified investment tiers: Zopa Core and Zopa Plus. Returns have increased from 3.7% for Core and 4.5% for Plus respectively. The higher rate reflected by Plus is indicative of an increase in risk profile. Zopa said this is the first time target returns have increased since 2015. Softbank Group, the Japanese technology conglomerate, is considering the sale of 30 per cent of the shares in Softbank Corp, a subsidiary that is Japan’s third-biggest mobile phone operator, in an initial public offering. The mega-deal could raise up to two trillion yen (£13 billion) and may take place this year in Tokyo and London, with the proceeds channelled into investments in new technology businesses, the newspaper Nikkei reported last week. Research from an independent senior recruitment specialist firm, Tindall Perry, reveals that 74 per cent of finance directors describe their knowledge of alternative finance as average or above. However, only a quarter said they were comfortable with accessing crowdfunding or peer-to-peer lending. In contrast, 85 per cent of companies said that they understood how best to access asset-based lending (ABL), while invoice finance, trade finance and venture capital all saw a positive response rate of between 55 and 75 per cent. Despite this, traditional bank lending remained the funding of choice for financial directors, with 83 per cent suggesting that they would approach their bank for finance in the first instance. “We’ve recruited more than 1,000 specialised consultants across BCG working on topics which didn’t exist just five years ago,” says Mr Morel. They are technologists, data scientists and process specialists who help banks decide what to prioritise and how to design and implement solutions. Most of those newcomers work in financial services, including 100 who work with UK institutions. LendInvest has been named the exclusive development finance lender on the first phase of a long-term development scheme that aims to build up to 5,750 new homes outside Dover in Kent. The lender is funding the first 216 units on the first section of the site to be developed by Halsbury Homes – the largest number of units it has funded so far. In fact, with real estate crowdfunding services like Fundrise Reviews you can invest with as little as £500 in commercial real estate. Something that means you could be looking at a return of over 10 per cent, not bad for such a small investment. Peer to peer lending is another fantastic option for investors that have a smaller pool of capital to work from. The past New Year’s Day holiday might not have been a time of celebration for some Peer-to-Peer (P2P) investors in China. Several Chinese online lending platforms announced a repayment delay or liquidation amid tightening government regulations. On Dec. 26, 2017, a Beijing-based online lending platform ishoutou.com made an online announcement that it was going into liquidation due to compliance risks. It promised to pay back all loans by 30 percent, 30 percent and 40 percent respectively in the three months from February to April. However, the company owner, Yang Yinghua, went missing the next day. And yet it is Orange that has launched one of the most audacious attempts to break into mainstream banking and challenge tarnished incumbents. A couple of months ago Orange Bank was launched with a mission to attract 2m clients and shake up the staid world of French finance. The shift to smartphone banking should put telecom operators, handset makers and the big technology groups in a strong position to go head to head with the traditional banks. Springhouse today announced that it has received Morningstar Credit Ratings, LLC’s MOR RV2 residential-vendor ranking as an asset valuation provider. Morningstar’s forecast for the ranking is Positive. As a member of the Altisource Portfolio Solutions S.A. family of businesses (“Altisource”), Springhouse leverages Altisource’s shared services. Eiffel Investment Group actively supports the development of digital lending throughout Europe. We are excited to sponsor the first EUROPEAN DIGITAL LENDING AWARDS. The event will take place on February 1st, 2018, in Paris (25 Rue du Petit Musc, 75004 Paris) at 7 pm. If you would like to attend, please send us an email at contact@eiffel-ig.com (advanced registration is mandatory). Launched in January, the company’s ‘borderless’ account – coupled with a debit card – allows users to hold up to twenty-eight currencies. Once signed up, account holders can carry out transactions in a currency of their choice as they travel around the world. But there are other new players in the market. For instance, Revolut – which styles itself as a digital banking alternative, offers a prepaid debit card that allows users to hold up to sixteen currencies. Again, transactions can be carried out in the currency of choice. Meanwhile, WorldFirst – a foreign exchange broker serving companies and relatively wealthy individuals – last year announced that it was launching a World Account, Aimed at SMEs, the new account offers the ability to open local bank accounts overseas and hold dollars, sterling and euros. To Illustrate the potential demand for its service, Worldfirst cited research suggesting that small and medium-sized companies were carrying out foreign-exchange trades to a value of £76bn every month. According to Bank of America’s Year-end Millennial Snapshot, 49% of Millennials believed that the Great Recession drastically altered their attitudes about banks, specifically with regard to their saving, investment and expenditure. According to PwC’s Global FinTech Report 2017, FinTech startup funding is over $40 billion in cumulative investment, growing at a compound annual growth rate (CAGR) of 41% over the last four years. 59% of Millennials interviewed by BNY Mellon says they’ve never come across a financial product specifically meant for them. A report by The Millennial Disruption Index cited that all the four leading banks in the US are among the least-loved brands by millennials. Spotcap has entered into a market-leading strategic partnership with BAWAG Group to give Austrian small and medium-sized enterprises (SMEs) access to same-day financing. More than 99 percent of Austrian businesses are small or medium-sizedand access to finance is a key challenge for SMEs in Austria, as it is for SMEs globally. We will now provide Lending as a Service to major institutions in addition to our direct SME loan offering in the United Kingdom, the Netherlands, Spain, Australia & New Zealand. AlfaToken, a service enabling startups and innovative entrepreneurs to create their own ICO tokens and smart contracts without coding skills, is gearing about to conduct its Initial Token Offering with the help of ICOBox, the world’s leading provider of ICO solutions. AlfaToken plans to offer services in 14 smart contract areas, from initial coin offerings and real estate rentals, lending and insurance, to business process management, smart homes and property transfers. Founded in 2017, AlfaToken identified a gap in the ICO market where initial coin offerings are forecast to rise from 43 in 2016 to 537 in 2017, according to coinmarketcap.com. In particular, the company perceived an opportunity for its Ethereum smart contracts in the real estate rentals market, worth $2.8 billion (Airbnb forecasts), in the peer-to-peer lending market (including mortgages), worth up to $180 billion according to Business Insider, and also the insurance market valued at $4.5 trillion according to a 2016 report by the Institute of International Finance. Every digital financial transaction you’ve ever made in your life has had to go through a bank or large financial institution at some point. They authorise, facilitate and record the transaction, often taking a cut along the way. Blockchain essentially replaces the middleman in this process. It’s international, unregulated, instant and unhackable. 94% of economists surveyed by finder.com.au in November 2017 expect blockchain will have widespread use in the financial sector and economy. Although biometric payments are increasing, finder.com.au research shows 60% of Aussies – over 11 million people – either feel uncomfortable using biometric identification when logging on to their mobile banking apps, or aren’t really sure about it. Australia’s cash rate sat stagnant throughout 2017 at a record low of 1.5%, producing low savings rates, cheap mortgages and escalating property prices. A sharp rise in mobile and online banking has meant Australians are less likely than ever to need to visit their local branch. We expect the number of branches to fall further in rural, regional and remote areas. For example, the average three-year term deposit in December 2017 paid 2.55% interest. However, peer-to-peer lender RateSetter are currently offering 7.4% for the same period. The number of ATM withdrawals per month has fallen from a high of 73 million in 2010 to just 47 million in 2017. Finder’s 2017 Banking Innovation award went to Spriggy – an app which allows parents to pay pocket money onto debit cards. By far the biggest change to the financial industry in Australia will be the New Payments Platform (NPP), which will be switched on in phases from February 2018. It has been noted that youngsters are averting eyes towards quick personal loans with lesser interest rates rather than the credit cards, says Aditya Kumar, founder of Qbera, a Bengaluru based fintech company. They recently compiled a stats on spending on travel loan trends in 2017. “Millennials, covering more than 50 percent of the Indian population are constantly looking for online digital platforms to plan their finances for holidays; unlike their predecessors who’ve always relied on savings. It has been a regular practice to narrow down their search to fintech lenders for financing their travel needs,” he adds. According to his company’sstatistical report, out of 1700 applicants of travel loans till last year November, the age of 728 applicants is below 28 years and 105 female applicants within the age span of 20-28 years (both single and married), he adds. The Financial Services Authority (OJK) is planning to issue a policy in financial services institutions, including guiding principles for Digital Financial Services Providers that include registration and licensing mechanisms as well as the application of regulatory sandbox and policy on crowdfunding. Not only has the US Federal Reserve started to raise interest rates – a move mirrored by China’s central bank and the Hong Kong Monetary Authority with more developed countries expected to follow suit – but a market correction may be in the works following a strong run in both the US and Malaysian stock markets. Yet despite its prices taking a plunge recently, its demand is still going strong. Similarly, ethereum, ripple, litecoin and Zcash continue to enjoy the mania status garnered by anything related to cryptocurrency. Equally enticing opportunities are abound with the rapid growth of equity crowdfunding (ECF) and peer to peer (P2P) lending platforms. Axiata Group Bhd is in the process of building one of the largest fintech companies in Asia to include five micro services – payments, remittance, lending, savings, and insurance. President and group chief executive Officer Tan Sri Jamaludin Ibrahim said since 2013, Axiata had invested some US$200 million for its digital and internet ventures. Out of the US$200 million, RM50 million worth of investment went into Axiata’s fintech business. Russia’s biggest lender Sberbank plans to help small firms raise funds from private investors with a peer-to-business platform, three sources familiar with the plans said, competing with two other ventures that support the cash-starved companies. The state bank’s foray into p2b lending suggests it sees a revival in fortunes for small businesses as consumer spending picks up. It also reflects the commitment of chief executive German Gref to enhance the bank’s use of new technology.